Sideglide wrote: Is the front of the foot supposed to pivot? I see there is joint but it acts like it doesnt wanna go unless I break things. It's supposed to, it was probably designed to spring back due to the figure's weight. Torso is similar, I can hardly move it before it bounces back, and it doesn't rotate. I was playing around with the chain and the top of the cylinder popped off in my hand as I was turning it, thought that maybe I broke it, but it seems to just pop back on. Just thought I'd mention it in case it happens to anyone else. No need to panic. The toe does have a ratchet joint, it's just really stiff! Just noticed the heels also slides back, I'm guessing to give a bit more stability!? I didn't get this but I really want that 1/12 TK. Vali has been taken hostage by Dutch Customs. Will have to contact CS for an invoice. In Ireland they accept PayPal receipts as proof of value. I've even copy/paste the 3a page from "my orders" section. Different countries, different rules. I hate when stuff gets caught and I have to pay 20% plus handling. My own Death Mask arrived this morning. A small end of a pipe had come off the back but that was just a lack of glue and an easy fix. The neck collar was also loose and needed a spot of glue. Other than that it was fine. The bloody thing is very unstable standing up so will have to rest it against something. What a disaster these figures have been. 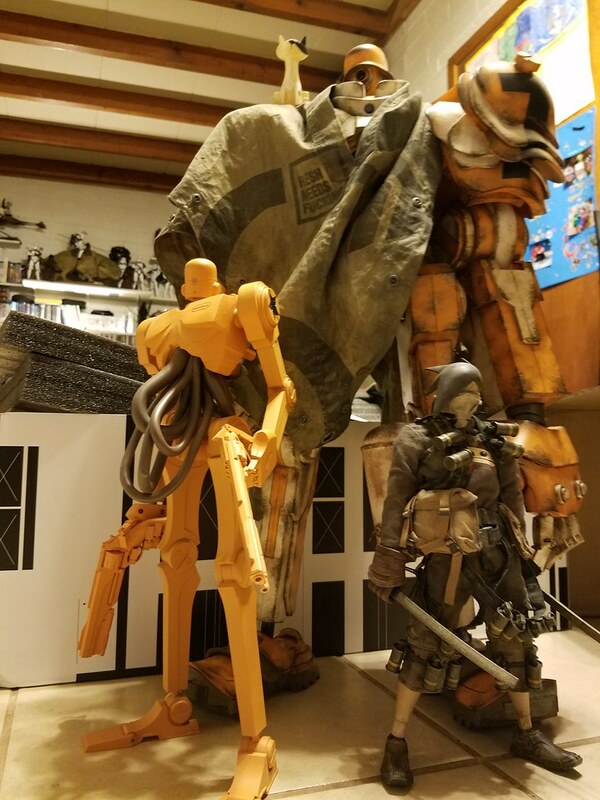 This will definately be the last non WWR big bot i will ever purchase from ThreeA. Just not worth the money, hassle, or stress they bring. No sign of my vali to AZ, tracking hasn't updated since the 20th of January when it processed through Guangzhou China... thought this was being shipped via ems? They were shipped EMS, but it is entirely possible it might not have made it out before CNY. Some places of business are still closed due to the holiday. Probably the case, can't do much about it but wait I guess. Cthulhu wrote: Probably the case, can't do much about it but wait I guess. Skipper11x wrote: In Ireland they accept PayPal receipts as proof of value. I've even copy/paste the 3a page from "my orders" section. Different countries, different rules. I hate when stuff gets caught and I have to pay 20% plus handling. I think it's pretty much the same within all European Union. Anyone seen Vali in European online shops? Thinking about picking up one...the more I see it on pics – the more I love it. so I never got an email from CS to make a final payment. Why did you use the link when it was posted? Or email them when it was announced to make payments? Assuming you are asking "why didn't I". I don't visit the forums that often , so didn't even know about the link. I came here after having trouble finding contact info. As for me not contacting them- honestly I got caught up in other things and forgot the deadline. The main thing I remembered was "you'll get a follow up email"- so I sadly thought that would happen . My message wasn't meant as a complaint - it was more "there's nothing I can do, right ?" I'd definitely still try contacting CS and explain your situation. It's worth a shot! Best of luck Ozy! Going on a month since mine shipped, still haven't received it yet. Hopefully this will be the week? Vali finally arrived in Tucson! Broken... but he's here... awesome looking figure, BIG... Wife's a little concerned about its new whereabouts. Can stand on its own but definitely needs some support to keep from toppling over. Paint is nice and ole skool dirt'ay! Love the head! Glad I bought it, steep price but I think it's well worth it. If you bent its legs and make him cower a bit you can block its legs with its feet and he stands stable on his legs. Love this bigboy, regardless the engineering challenges of such a large figure and 2 rather odd trade offs. Booklets and poster are also worth mentioning. Especially "The Observer Field Guidus" which comes with a nice size chart of various Mortis bots. Finally put an end to the uncertainty about the exact scale of TK Hunter (It's one/6th). gar wrote: If you bent its legs and make him cower a bit you can block its legs with its feet and he stands stable on his legs. After looking at the guide and size chart for Mortis Bots I hate to say it for the people thinking that there will be a 1/6 scale Bot your out of luck. The reason why I think this is the comparison of the TK hunter to the DRESDEN FRAU Gunner chick with legs in size chart. if there is a 1/6 made then DRESDEN FRAU would be out of proportion and size. "The Observer Field Guidus" which comes with a nice size chart of various Mortis bots.